Hi Everyone! Happy Sunday to y'all. Just a card I made this morning. 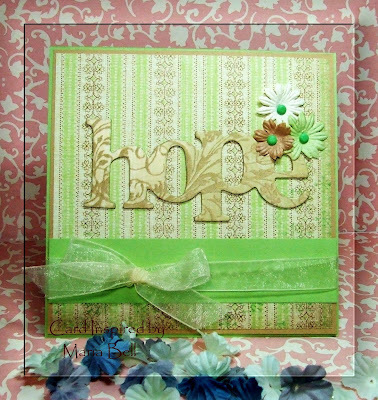 I thought the "hope" chipboard sticker was a great sentiment for a card. I have a lot of chipboard stickers or stickers in general and really would like to use them up. I also have a lot of Primas so I think I need to concentrate on using them up. The sticker is by K&Co as well as the paper. The cardstock are SU Gable Green and Creamy Caramel. I used JoAnn Brads to secure the Prima flowers. I'm not quite back from my blog break but I think I'll be able to post regularly again sometime this week. Glad to see you! This is so beautiful, I luv how you put it all together & the 3 primas give it a special touch! So good to read you again !! that was a pretty quick/short blog break !!! Hope you got things done !! well... as usual... very very pretty card there !! Cool card...is that on acetate? Beautiful! Love the freshness of your colour scheme, and that hope sentiment is awesome! Surprise! I finished a book! LOL!